The Guest (Hangul: 손 the guest; RR: Son the guest; lit. Hand: the guest) is a 2018 South Korean television series about exorcism and shamanism that stars Kim Dong-wook, Kim Jae-wook, and Jung Eun-chae. It aired from September 12 to November 1, 2018 on OCN's first series on the newly-created Wednesdays and Thursdays at 23:00 KST time slot. Despite not airing in prime time, the series received a peak rating of 4% nationwide. Twenty years ago, Yoon Hwa Pyung (Kim Dong-wook), a young psychic born into a shaman family, learns about the powerful demon called "Sohn" (Guest). The demon is very powerful and possesses the power to control other demons and allow them to possess weak people. The possessed people then go mad, kill their families, and stab themselves in the eye. Hwa Pyung, Choi Yoon (Kim Jae-wook); a young boy born in a religious Catholic family, and Kang Kil-Young (Jung Eun-chae); the daughter of a detective, fatefully meet when their families are killed by a demon. Twenty years later, the demon killings started again. Hwa Pyung is now a taxi driver who uses his power to seek out possessed people in order to help them, Yoon is a Catholic priest who is talented in exorcism, and Kil Young is a detective who doesn't believe in ghosts. The trio meets again and tries to work together to defeat "Sohn". A shaman who was born with psychic powers. A cynical and cold priest who alienates people but is recognized by his abilities as an exorcist. A passionate and tough but easygoing detective who does not believe in the supernatural. Note: TNmS stopped releasing viewership numbers on their website, the only source for them now are news articles. ^ Lee, Jung-hee (September 14, 2018). "귀신 들린 자의 범죄? 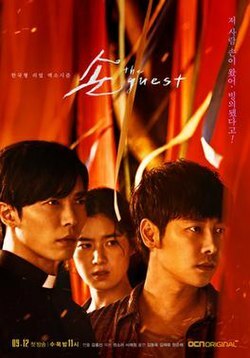 첫회부터 압도적인 '손 the guest'". oh my star (in Korean). Retrieved September 14, 2018. ^ the guest 수목 밤 11시, OCN 오리지널의 새판이 벌어진다 180912 EP.0. YouTube (in Korean). OCN. Retrieved August 4, 2018. ^ Im, Eun-byel. "OCN to air another shamanism series". Kpop Herald. Herald Corporation. Retrieved July 12, 2018. ^ Kim, Hyun-rok. "김동욱X김재욱X정은채, '손 the guest' 출연 확정". Naver (in Korean). Star News. Retrieved July 12, 2018. ^ "[단독] 김재욱·김동욱·정은채 '손 the guest', 9월12일 첫방 확정". Naver (in Korean). Sports Donga. Retrieved August 3, 2018. ^ "'The Guest' explores exorcism, supernatural power". The Korea Times. September 7, 2018. ^ "최승훈, '보이스'→'손' 합류 확정…아역 대세 등극". Naver (in Korean). TV Report. August 9, 2018. ^ "김동욱, '손 the guest' 주인공 윤화평 役 확정…9월 첫 방송(공식)". MK News (in Korean). MK Sports. May 23, 2018. Retrieved July 13, 2018. ^ Sung, Ji-eun. "Kim Jae-uck to play cynical priest in 'Guest'". Korea JoongAng Daily. Korea JoongAng Daily. Retrieved July 12, 2018. ^ "[단독] 정은채, OCN 첫 수목극 '손' 출연…김동욱·김재욱과 호흡". Sports DongA (in Korean). May 10, 2018. Retrieved July 13, 2018. ^ "이원종, OCN '손 the guest' 출연 확정…박수무당 변신 예고". Herald Corporation (in Korean). June 19, 2018. Retrieved July 13, 2018. ^ Noh, Han-sol. "박호산, '나의 아저씨' 이어 '손:더 게스트' 고봉상 경사 役 합류". TV Daily (in Korean). TV Daily. Retrieved July 12, 2018. ^ "[e영상]'손 the guest' 이원종x박호산x안내상, '연기 神'들이 뭉쳤다". Naver (in Korean). enews24. September 3, 2018. ^ Lee, A-young. "'예쁜 누나' 윤종석, OCN '손' 캐스팅…김재욱·김동욱과 호흡". Naver (in Korean). Xports News. Retrieved July 12, 2018. ^ Jung, Yoo-na (September 20, 2018). "'손 the guest' 상처투성이 김동욱X김재욱, 일촉즉발 위기 '포착'". Sports Chosun (in Korean). Retrieved September 22, 2018. ^ a b Hong, Se-young (September 21, 2018). "[TV북마크] '손 the guest' 3.2% 자체 최고…구마 실패 '충격 엔딩'". Sports Donga (in Korean). Retrieved September 22, 2018. ^ Park, Kwi-im (October 5, 2018). "'손 the guest' 김혜은, 두 얼굴로 완성한 역대급 소름 엔딩 [콕TV]". TV Report (in Korean). Retrieved October 5, 2018. ^ Kim, Na-hee (September 28, 2018). "김동욱X김재욱X정은채, '손 the guest'에 현혹되지 않았다 '구마 성공'". Osen (in Korean). Retrieved October 5, 2018. ^ "'손 the guest' 허율, 영매로 등장...역대급 빙의에 '소름' 엔딩". Seoul En (in Korean). October 5, 2018. Retrieved October 5, 2018. ^ Park, Kwi-im (October 5, 2018). "'손 the guest' 김동욱X김재욱X허율, 심장까지 파고드는 반전 공포ing [콕TV]". TV Report (in Korean). Retrieved October 5, 2018. ^ Park, So-yeong (October 5, 2018). ""김동욱x김재욱 구해줘"..'손 the guest' 허율, 역대급 오싹 빙의[종합]". Osen (in Korean). Retrieved October 5, 2018. ^ Lee, Ye-eun (October 1, 2018). "감독 겸 배우 이상훈, '손 the guest' 합류…영화 '토일렛' 연출가". My Daily (in Korean). Retrieved October 5, 2018. ^ Hwang, Soo-yeon (October 4, 2018). ""죽음도 막지 못한 모성애" '손 더 게스트' 하지은의 재발견". Newsen (in Korean). Retrieved October 13, 2018. ^ "한규원, '손 the guest' 첫 회 출연…김동욱과 호흡(공식)". Naver (in Korean). MBN. September 5, 2018. ^ Kim, Na-hee (September 13, 2018). "첫방 '손 the guest', 韓 샤먼 엑소시즘 서막 알렸다..최고 1.9%". Osen (in Korean). Retrieved September 23, 2018. ^ Son, Jin-ah (October 4, 2018). "오존, '손 the guest' OST 첫 주자 출격…4일 발매". MK News (in Korean). Retrieved October 13, 2018. ^ Lee, Sa-kyum (October 11, 2018). "'괴물 보컬' 손승연, 오늘(11일) '손 the guest' OST Part.2 '나쁜 꿈' 발매". Star News (in Korean). Retrieved October 13, 2018. ^ "AGB Daily Ratings: this links to current day-select the date from drop down menu". AGB Nielsen Media Research (in Korean). Retrieved September 13, 2018. ^ Lee, Soo-ji (September 13, 2018). "원귀·영매 난무하네, OCN '손 the guest' 첫회부터 으스스". Newsis (in Korean). Retrieved September 13, 2018. ^ a b Kang, Ki-hyang (September 27, 2018). "'손 the guest', 40대 여성 시청자 사로잡고 6.0%까지 상승 '여심 스틸러'". Star Hankook Ilbo (in Korean). Retrieved September 27, 2018. ^ Min, Young-bin (September 27, 2018). "'손 THE GUEST', 연속 3회 시청률 상승". News Woks (in Korean). Retrieved September 27, 2018. ^ Lee, Soo-ji (October 5, 2018). "OCN 수목극 '손 the quest' 엑소시즘, 수도권에서 통하네". Newsis (in Korean). Retrieved October 5, 2018. ^ a b c d Kang, Gi-hyang (October 5, 2018). "'손 the guest', 전국 시청률 하락 속…수도권은 상승! 3040 여심 사로잡았네". Star Hankook Ilbo. Retrieved October 5, 2018. ^ a b Lee, Soo-ji (October 18, 2018). "CJ 집안 전쟁, '손 the guest', '하늘에서 내리는 일억개의 별' 계속 울려". Newsis (in Korean). Retrieved October 18, 2018. ^ Lee, Soo-ji (October 19, 2018). "사람 위에 귀신 있다, OCN '손 the guest' 시청률 쑥쑥". Newsis (in Korean). Retrieved October 19, 2018. ^ Kang, Ki-hyan (October 19, 2018). "'손 the guest' 시청률, 화제의 연속! 시청률 상승 성공…비지상파 전체 1위 차지". Star Hankook Ilbo. Retrieved October 19, 2018. ^ a b Shin, Seung-hee (October 26, 2018). "'손 the guest' 시청률 5%대 돌파.. 비지상파 1위". Veritas (in Korean). Retrieved October 27, 2018. ^ a b Lee, Soo-ji (November 2, 2018). "OCN 수목극 '손 the guest' 이슈·시청률 다 잡으며 종방". Newsis (in Korean). Retrieved November 6, 2018.